I came across another helpful natural remedy not long ago and wanted to write about it today. Colloidal silver is an inexpensive healing agent and disinfectant. It is a liquid composed of 99.9 percent pure silver particles that are suspended in water. The basic premise is that bacteria can't grow in the presence of silver and this makes colloidal silver a great internal and external disinfectant. In fact it has been shown to be effective agains more than 650 disease-causing bacteria, including such organisms as Escherichia coli (E. coli) bacteria and the fungus Candida albicans. It even works agains viruses. 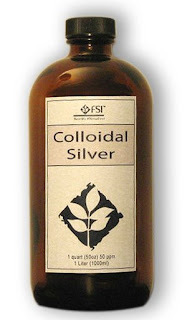 Colloidal silver has been used for years in homeopathic, Ayurvedic and Chinese medicine. It's completely safe when used as directed, even for infants and children. (I know, someone is about to mention the "blue man." A man who purportedly used colloidal silver and turned his skin permanently blue. I looked into that story and apparently he was trying to make his own funky colloidal silver at home. Don't try that.) Back before antibiotics, refrigeration, and pasteurization people used to put silver coins in milk to keep bacteria from growing. You've heard the "born with a silver spoon in her/his mouth" phrase - well, apparently, the wealthy of the time would have their eating utensils made of silver in order to prevent bacteria growth on their food. Silver coins would even be thrown down into water wells to keep stagnant water drinkable. Here are some ways that colloidal silver can benefit you and your family. is effective externally on burns, abrasions, and cuts - it fights infection and helps to heal skin damaged tissue. can be applied directly to the ears for an ear infection or used in a neti pot for sinus infections. can be used to treat drinking water. It is recommended to use some in travel and camping trips as you can add one ounce of colloidal silver in a quart of water and get the germicidal benefits from it. can be used pretty much any time when bacterial, fungal, or yeast infections are suspected. Note: for serious or life threatening conditions one should always consult their physician. Safe Doses: It's important to use this product as recommended. The bottle you purchase will give you the correct amount to take daily and do not take for more than 2 weeks at a time with a two week rest window in between the next round. Do not take if you are currently on thryroxin, quinolones, penacillamines and tetracyclines as the silver has a definte reaction with these pharmaceuticals. This is a great addition to your medicine cabinet - check your local health food store or email me and I can give you some other options. Labels: Children's Remedies, What's in Your Medicine Cabinet?? I learned about it this past summer from my mother... She and I are both rather well-endowed, although she's not obese like me. In the heat we often get a smelly rash under our breasts, and she was telling me that it disappeared when she used colloidal silver. Strangely enough I didn't get the rash this summer, which I can only ascribe to my body being more alkaline from eating healthy. Hanlie it sounds like your mom is very homeopathic. She introduced you to Arnica and now colloidal silver. I love it! I'm sure staying as alkaline as possible really helps with all infections. I'm loving using apple cider vinegar from Body Ami daily.